For years I went to church by myself and prayed for my atheist,unpleasant husband to get saved. After 5 years of praying for him, God intervened and got a hold of his heart. Wives, I want you to be encouraged that even though your husband may not know Christ now, do NOT give up on praying for him. If you don’t pray then the enemy wins and keeps him. I often look back and think what if I would have given up? What if I would have stopped praying? What if I left and got a divorce? I know that I would not have given God a chance to finish his part and complete a work in my husband. I know that I would not have been married for 19 years and have the marital blessings, happiness and oneness that we have today in our marriage. When we pray we combat the enemy’s plans to destroy our lives. I didn’t let the enemy win and I pray that you won’t let him win either. Do Not give up wives. Your harvest will come in due time. God loves you and will honor your sacrifice. Im glad im not alone, I’ve been married for almost two years and ive always wanet my husband to go with me to church but he believes that we dont need be at church to talk to God or sing to God any of that. Plus he likes heavy metal and we also have a one year old son, i want the best for my son and family but honestly sometimes i feel like giving up. I just wish we can go church as a family instead of just me and my son. I feel like people from church see me and wonder why i married a person who doesn’t wanna go with me church. Thank you for being obident with your post. I have been married for 20 years & saved for 10. I have prayed & prayed for my husbands salvation & honestly felt recently that it would never happen. Thank you, for the encouragement to fight the fight. My husband is saved in the name of Jesus!! My husband is the spiritial leader of our home! I’m comfessing it & believing it!!! ON FACEBOOK…ANTHONY TONY CARROZZA AND I AM SUBSCRIBED TO YOU . I AM SEPERATED FROM MY WIFE AND DESPERATELY WANT TO SAVE MY MARRIAGE. I PRAY ,HARD , EVERYDAY FOR HER AND BOTH OF US. I ASKED HER OVER A YEAR AGO TO START GOING BACK TO CHURCH. SHE FEFUSED. WE ARE BOTH CATHOLIC. I HAVE GONE BACK EIGHT MONTHS AGO. DOES THIS WORK IF MEN PRAY FOR THEIR WIVES AS WELL. SINCERELY, DESPERATE AND BROKEN. I pray for mine everyday, God is chasing after him big time! I too have the hope that he will be saved and join me in church. Thanks for all the inspiring testimonies! I too am a lviing testimony to the power of prayer in a husband’s life. 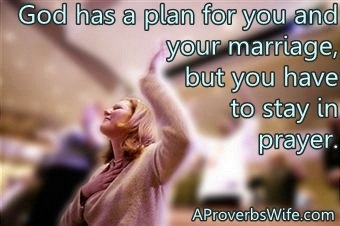 It can turn the worst of marriage situations into the best of marriage situations – try it and see, and yes, don’t give up!!! Thanks for sharing! just the encouraging words i needed! Talk about a testimony!!! This hits a little close to home, and I just thank you for sharing your story! wow this is truly inspiring! I agree pray for him and he will come around! What a powerful story — thank you for sharing!